We returned from our New England vacation this morning. I will be posting about it later in the week or maybe next week. We'll see. For now I will say that the Wife and I are becoming vacation snobs and we both agree that this vacation, while nice, didn't have enough "WOW" moments. I would give it a four or five out of ten. The mediocre nature of the vacation failed to pull me completely out of the minor funk I'd been in before heading to New England. I think the funk is just a combination of anticipation and dread resulting from the approaching RAGBRAI ordeal. While I was on vacation I was constantly reminded by people on bicycles that I was not training of RAGBRAI. Two people I know, KSam and the Matron Of Honor, suggested that I continue my training while on vacation by taking advantage of the hotel exercise rooms. In the two weeks we were on vacation I think we stayed in one hotel that had an exercise room (I'm not sure since I never actually went out looking for the exercise room). The Wife and I, when travelling domestically, don't splurge on fancy hotels with amenities. Though we did find out that crappy WiFi in our room is a deal breaker for us - times, they are a changin'. We got home today at 9:30AM and I managed to get a bike ride in this afternoon. I did a relatively short 35.5 miles (57.1 km). Yes I was out of shape but I didn't feel as bad as I expected. I think the temperature and humidity were a bigger factor than the two week training hiatus. My plan now is to ride every day between now and the eleventh of July (one week before RAGBRAI) though I will be taking this weekend off while we visit the In-Law's lake house on the fourth. After that we'll just see how stubborn I can be and how much I want to finish the cross state bike ride. We're off traveling. 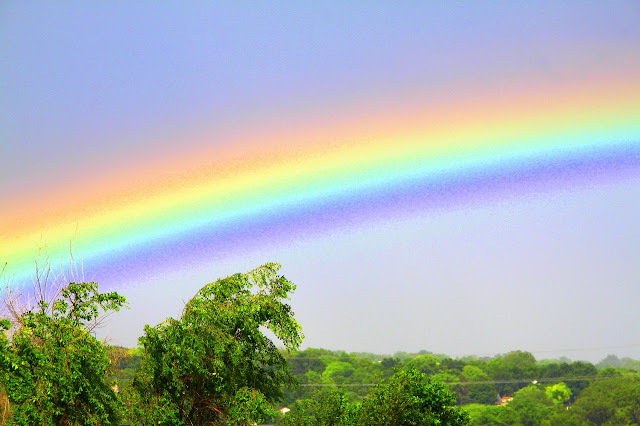 While we're gone, here are a couple pictures of a rainbow I saw off our deck. Later people. Our New England vacation will soon be upon us and my RAGBRAI training will be interrupted for a couple weeks. Not sure if I'll miss the rides or will be relieved to have a break. I've said before, I like the idea of RAGBRAI but I'm not thrilled with all the training rides. Having said this, I've made progress since my last cycling update back on May 22. Last Tuesday, a day when the temperatures peaked at 99.6°F (37.6°C) in our backyard, I pushed my personal best up to 51.2 miles (82.4 km). It was 73°F when I started and in the low 90s when I finished. While this is a good distance, the shortest RAGBRAI leg is 56 miles long ... with more hills ... and probably hotter ... and windier. I must be crazy. Anyway, things are looking up. A few weeks ago I started taking snacks with me while riding. This started while I was reading "Faster, Higher, Stronger" which pointed out that the body stores enough fuel for between an hour and two of exertion. Since my bike rides were pushing over three hours a snack seemed logical. I started with fruit snacks which are essentially gummy sugar bombs. They worked as I had more energy but my body would crash after I got home and it took a couple days for my muscles to recuperate afterwards. Then I ran out of fruit snacks. After running out of fruit snacks before grocery day I decided to fill the gap with a Clif Builder's bar and a bag of my personal homemade trail mix (two parts almonds, two parts walnuts, one part each of pumpkin seed, dried cherries, dried blueberries, and dried pineapple). While I was riding I really didn't notice a difference but afterward ... after the past two rides my muscles have recovered in less than twelve hours. I'm not totally sure it's that added protein and fat or if my muscles just crossed some threshold but I'm planning to pack Clif bars and trail mix when I ride RAGBRAI just in case. I fit in a shorter training ride yesterday afternoon and I hope to get another one in either tomorrow or Monday. I don't intend to go for any personal bests until I return from my vacation. The good thing is, a 'short ride' has shifted from 32 miles to 42 miles now. My next goal before RAGBRAI will be 60 miles (96.6 km) by July 11 (a week before the start of RAGBRAI). Not sure I will be able to make this goal, having been off the bike for two weeks, but I won't know unless I try. I like learning things I hadn't known before. My latest read, Greg Grandin's "Fordlandia: The Rise and Fall of Henry Ford's Forgotten Jungle City ", taught me a lot about Henry Ford, the father of the assembly line, and took me places I have never been. The title of the book, Fordlandia, is the name of a large rubber plantation set up in Brazil along the Tapajós river by the Ford Motor Company. The plantation was both an attempt to provide rubber for car tires as well as being a social experiment of transplanting American small town principles to the jungles of the Amazon. The book follows the rise and eventual fall of Fordlandia. Interspersed with the building of the Fordlandia we learn about the eccentric personality of Henry Ford, his pacifism, and his attempt to bring social change both in the United States and the world. Ford comes across as a mix of opposing ideas and views all wrapped up in an almost tyrannical megalomaniac. Reading about his ideas and contradictions just made me shake my head. This book was a slow read for me but I think that was more because of the slight funk I've been in more than the quality of the writing. I found the book both informative and entertaining. For that reason I gave the book four stars on Goodreads. 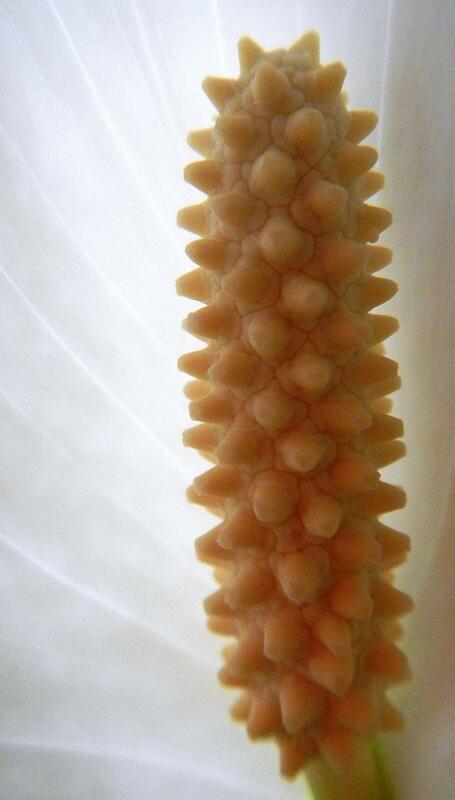 "Calla Lily ... Close Up"
On Tuesday night I went camping, returning to Preparation Canyon for the third time. I aimed for campsite number six but missed the turnoff for it somehow and ended up setting up at campsite number four. What I have discovered at Preparation Canyon is that few of their campsites are on level ground. This would affect me later on. My campsite with the mystery tuft of grass. The campsite was an area of mowed grass with a fire ring (in the center of the picture surrounded by tall grass), a picnic table, and a mystery tuft of grass (on the right). The tuft of grass was surrounded by mown grass. There was nothing in the tuft that would prevent you from mowing it - no stump or rock - just grass. Rain was in the forecast. I totally expected to wake up in the rain. I pitched my tent on the high side of the slanting campsite and sat on the picnic table to enjoy the sunny day while it lasted. I hadn't expected any sun so when the sun came out it was a pleasant, though a bit muggy, surprise. I spent the late afternoon and evening reading, eating, and playing with fire. For my evening meal I had Mountain House dehydrated macaroni and cheese. It was ok but I found the macaroni a bit too firm for my tastes. Perhaps I should have let it set a bit longer. It did smell and taste good though. Along with the Mac and Cheese I had a Bridgford Ready to Eat Beef with BBQ sauce Sandwich. The sandwich bread totally encapsulates the BBQ beef. You can heat them up by putting the pouch in boiling water but a sandwich in its pouch would not fit in my cooking pot and would have used a lot of water to completely immerse it. I ended up just letting it sit in the sun for a while. The sandwich was surprisingly good. The bread was soft and was similar to the end pieces of a loaf of bread. The BBQ beef tasted good but the quantity of beef was lacking. I will have to look into buying more of these. After eating dinner and reading a little I decided to light a fire. I collected wood and kindle. Stacked it up in the fire ring and took out a cotton ball soaked in vaseline. Instead of using the lighter I usually use, I pulled out the flint and steel. I figured I would try unsuccessfully to light the fire and, after becoming frustrated, would pull out the lighter. To my surprise after just a few attempts the cotton ball burst into flame. It took less than a minute of trying. Cool. I'm ready for Survivor. I read for a couple hours, got in my tent early, and read some more. Knowing that rain would be on the way, I repacked my backpack so I would be ready to leave in a hurry in the morning. It was supposed to be in the low 60s overnight so I didn't unpack my sleeping bag, opting instead to just sleep in my sleeping bag liner. I woke up at 10:00PM to the sound of taps. It wasn't a bugle or horn. Not sure what it was being played on but it had a nice tone. Not exactly what I was expecting to hear while camping. The park is surrounded by farms so I suppose it came from a nearby farm house. At midnight I woke up and realized it was a little chillier than I expected. I think I always overestimate how warm my sleeping bag liner is. I pulled out my sleeping bag which remedied the situation while introducing another. I'd been using the sleeping bag in its stuff sack as a pillow. I folded some clothes and put them under the sleeping pad which pushed it up enough to be pillo-esque. Sometime after midnight a critter came near my campsite. From my last camp I know it was a buck. Sometime before 3:00AM I noticed that I'd pitched the tent in the wrong direction. I had aligned the tent perpendicular to the slope. The result is that I slid down the hill until I pressed against my tent pole (my tent uses my hiking poles as tent poles). The end of the pole slid making the tent unstable. Several times during the night I had to shift the poles back to vertical position before the tent came down on me. I think the appropriate alignment would have been with my feet pointing downhill. That's why I'm doing these camps - to learn lessons. At 3:00AM my tent started getting lit up by the lightning. I knew it was going to rain. I'd planned for it. The lightning was not expected and I became worried that the storm might be more than I planned for. I wondered if I should finish the night sleeping in my car. I didn't. At 4:00AM the lightning was joined by the sound of thunder and the pitter-patter of rain. Fortunately the wind that had been blowing most of the afternoon had died down a bit. Over the next hour or so it alternated between rain and drizzle. I managed to sleep a little more before waking around 5:40AM when a few drops of water managed to get in through the tent's vent - something that wouldn't have happened if the poles hadn't slipped again. At this point I was wide awake, the rain had slowed to a light drizzle, and there wasn't any reason to try to sleep anymore. I think I managed to sleep some five or six hours total ... intermittently. I packed the last things in my backpack (it was dry), dressed, and stepped out into the drizzle. I packed up the tent and tent footprint and walked to the car. It naturally stopped raining as I was walking to the car. I crashed on the sofa after I got home. I'd hoped that the bike ride I took yesterday morning would have made it easier for me to fall asleep. It did on my last camp but not on this one. This will be my last overnight camp until RAGBRAI and Rocky Mountain National Park. Time for more bike rides and our upcoming New England Vacation.